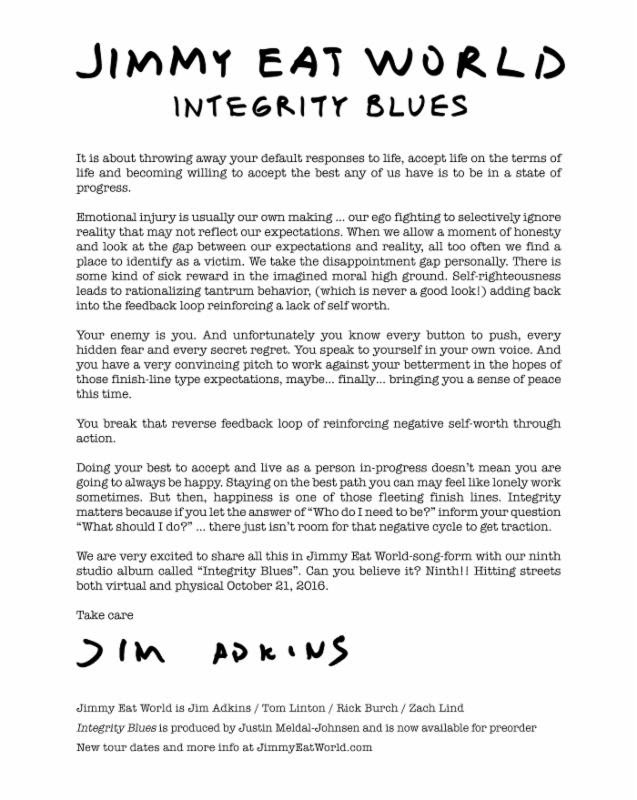 Integrity Blues is available for preorder now from iTunes, Amazon mp3 and jimmyeatworld.com. Pre-order directly from the band here for exclusive bundles including colored vinyl, tshirts, and limited signed lithographs. Jim Adkins stopped by KROQ Los Angeles’ Kevin & Bean morning show yesterday (August 30th) to debut “Sure and Certain”, the first single from the bands forthcoming album, Integrity Blues. Integrity Blues will be released October 21st & was produced by Justin Meldal-Johnsen (Paramore, M83, and Air). Stay tuned to http://www.jimmyeatworld.com/ for all the latest news. 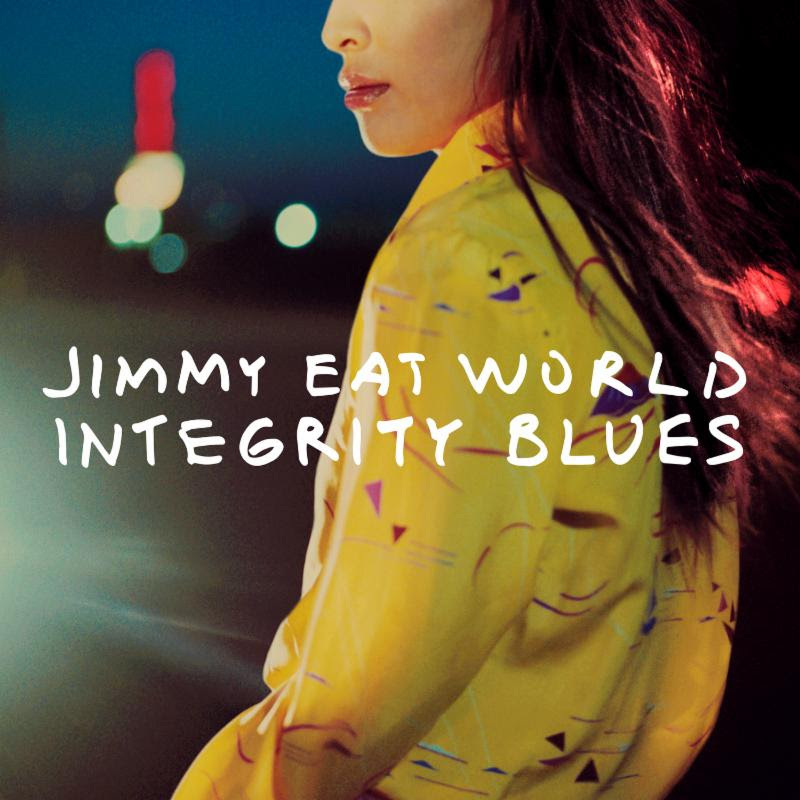 (New York, New York – October 21, 2016) Jimmy Eat World releases today their highly anticipated ninth studio album Integrity Blues via RCA Records. Produced by Justin Meldal-Johnsen (Paramore, M83), the 11 track LP features the first single, “Sure And Certain” along with the other previously released gems “Get Right,” “You With Me” and “You Are Free.” The single received rave reviews in the press with Entertainment Weekly calling it “a soaring, guitar-laden entry” and Consequence of Sound proclaiming the song “dolefully anthemic.” The band recently delivered a powerful performance of the track on The Late Show with Stephen Colbert and will be performing on Jimmy Kimmel Live! on October 25th. Jimmy Eat World is currently on their world tour, which will be stopping in Los Angeles and other parts of California before embarking on the European leg kicking off this November. The band announced this week additional U.S. tour dates in Minneapolis, Washington D.C., Asbury Park, NJ and New York City. Tickets for these new dates are on sale today at 10am local time. The band also announces today a headlining show in Montevideo, Uruguay on March 30th. Tickets will be on sale for this date November 4th. For a complete list of tour dates please visit: http://www.jimmyeatworld.com/tour. Nov 17 2016 Jimmy Eat World Share Music Video for "Sure and Certain"
Jimmy Eat World are happy to share their music video for “Sure and Certain,” off recently released Integrity Blues, out via RCA. The Flynt Flossy-directed music video is half animation half real life with an all around retro “Take On Me” music video vibe. Check out the awesome video below!